There’s a mystique that Texas likes to perpetuate — that everything is bigger here. And while it’s true that it is very big state, second only to Alaska, not everything is as impressively large as people here like to think. For example, in the area of sandwiches, I can tell you a New York deli sandwich is a heck of a lot larger as is the Philadelphia hoagie. The sandwiches here a not nearly as impressive. But here’s something Texas can really boast about. 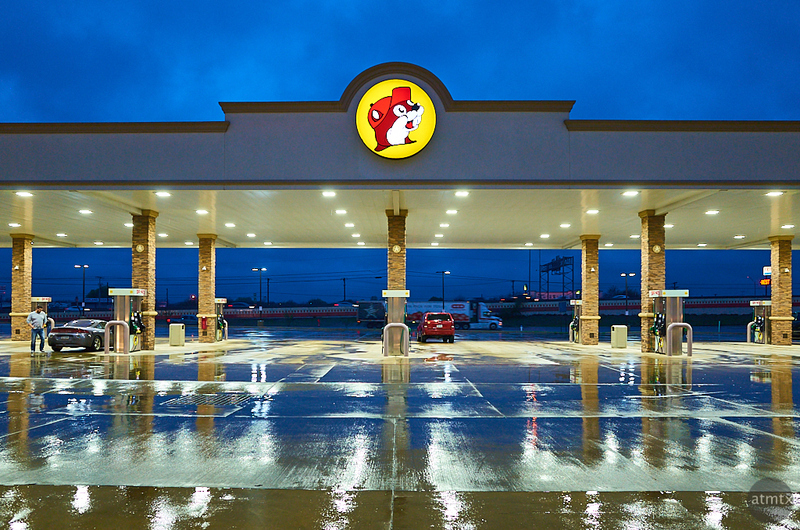 Last night, we stopped at Buc-ee’s, on the way back from San Antonio. Located in New Braunfels, conveniently off interstate 35, this place is grand in a way that truly deserves some boasting. In the short time since this place opened in 2012, the goofy and lovable beaver logo has become a recognizable symbol in these parts. We happened to park in the middle, which made for a nicely symmetrical blue hour image with rain-soaked reflections. This place boasts 120 gasoline pumps, of which this photo shows 16, which is only 13%. According to Wikipedia, the New Braunfels location is the largest convenience store in the world at 68,000 square feet. In addition to all the gas pumps, it has 83 toilets, 31 cash registers and 80 fountain drink dispensers. Part of my Daily Life Collection, shot with the compact Ricoh GR camera. Thank you, Simo. I too have struggled to get good colors out of the GR. This is a post processed RAW. I used Capture One which seems to work better than Aperture 3.